It pays to do your homework. Luck helps, too. Congratulations to the five PTAs that won prizes in the recent Ed100 drawing! At this point, over 1,500 schools in California are using Ed100.org to help them develop an informed school community. "Ed100 inspired many parents in our community to become more knowledgeable about complex issues related to education in California," said Jocelyn Kelleher, the Principal of Crocker Highlands school, which won the grand prize. "That helps us work together to improve outcomes for kids." If your school's PTA was not among the winners this time, don't despair! We will choose five new winners at the next drawing on June 4, 2019. 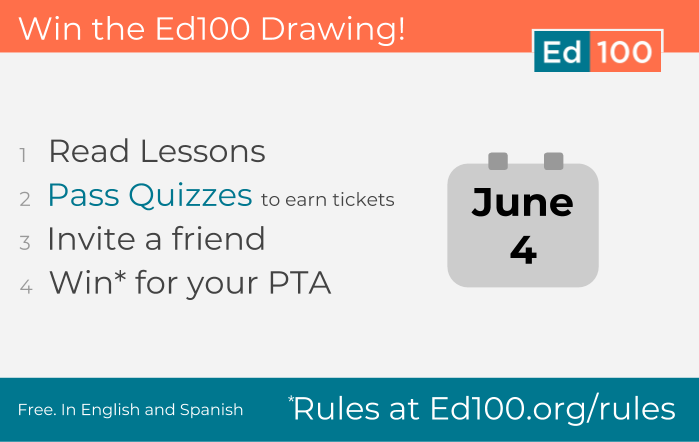 As always, the way to enter the drawing is to sign up at Ed100.org, read lessons and pass the quizzes associated with them. Each quiz you pass is an entry in the next drawing. Your school must have at least two participants to win. As you know (and, ahem, as you might want to share ;-) Ed100.org is a free, self-paced online course that demystifies California's education system one short lesson at a time, in English or in Spanish. Every time that a participant from your school community passes a quiz, they earn a ticket in the next drawing for your PTA. They also come closer to earning their Ed100 Graduate Certificate. The real prize, of course, is developing a well-informed school community. California's education system is complex and changing. But it can be understood, if you choose to learn about it on purpose. That's what Ed100 aims to help happen. People who understand the system can navigate it for themselves and play a part in improving it for everyone. You can progress through the lessons at any speed and in any order you like, but some have found it useful to synchronize with the Ed100 Chapter of the Month program. Check out the video summaries — you can still catch up! A parting thought: Hundreds of participants have completed all of the lessons of Ed100, earning the coveted Ed100 Graduate Certificate. Why not join them? It would make great a New Year's Resolution!